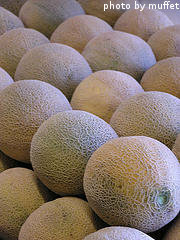 Cantaloupe Varieties - What's the Difference? 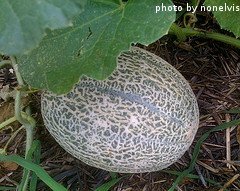 There are several cantaloupe varieties available to the backyard vegetable gardener. Most of the varieties have similar taste and texture. The biggest difference between different varieties of cantaloupe are the size of the melons. In recent years, bush varieties of cantaloupe have been developed for smaller gardens. Generally speaking, bush varieties of cantaloupe produce smaller fruit than traditional varieties. If you like cantaloupe, we encourage you to plant a couple of different varieties that mature at different times. This spreads out the harvest and gives you a supply of fresh cantaloupe for a longer period of time. We are often asked about our favorite variety of cantaloupe. We prefer Sweet Passion, which is an heirloom variety that can be traced back about 100 years to its origins in Ohio. It features 4 pound melons on prolific vines that demonstrate some drought and disease resistance. It takes around 85 days to mature and has the classic cantaloupe appearance with the brown netting and orange flesh. Very sweet and smooth, but not mushy.